Apivita Natural Serum Radiance: Natural Skincare That Works! Let me introduce you to my newfound skincare BFF - the Apivita Natural Serum Radiance with Bilberry & Vitamin C. I've been trying this out, and now that I'm almost halfway through the bottle, and have has too results, I thought I'd share my thoughts on the product with you guys! Apivita is a Greek brand emphasizing the use of natural ingredients, and holistic body care - while I'm most interested in skincare products, Apivita has a whole range of products, including haircare and body care, which is really impressive. Apivita has also consistently used natural ingredients that actually work in their products - and although I'm not a particularly big follower o the "natural" trend, I'm still really keen on their products as they perform really well based on standalone evaluation. This makes them, to my mind, far better than those "natural" brands with crappy products that offer only scaremongering as a selling point. In contrast, Apivita's products stand up to scrutiny, whether or not you are a proponent of natural skincare. My previous experiences with Apivita products has been very good, so the efficacy of their ingredients is well borne out by my own personal experience. But enough with my gushing, and on to the product review! 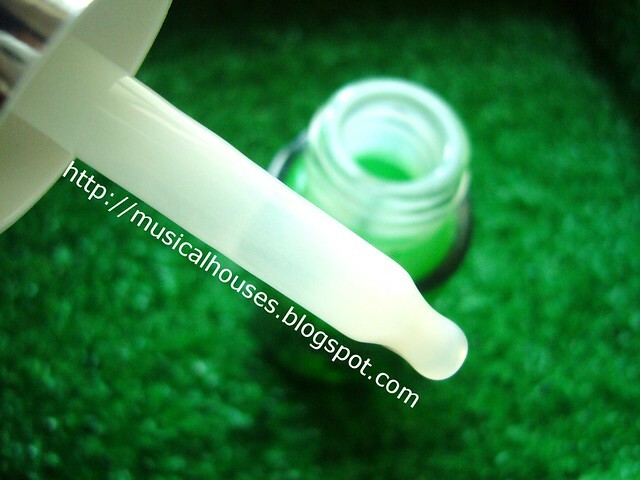 The Natural Serum Radiance is a very lightweight gel packaged in a green glass bottle. The glass bottle has a dropper so that dispersal of the product is more hygienic. I also have to say, the product is really very lightweight! I had expected it to be heavier, given that Olus Oil (vegetable oil), Olea Europaea Fruit Oil (olive oil), and Simmondsia Chinensis Seed Oil (jojoba oil) are all in the top 10 ingredients of the product. However, I found it to be really lightweight, and the product was a white, watery serum, that was only very slightly oily. In fact, if I hadn't read the ingredients list, I may not have guessed that there were these oils inside! I also liked the citrusy smell of the product (the smell is derived from the citrus extracts and citrus oils in the product). Since the serum is so lightweight, it absorbed really well without leaving any residue on the skin. It also moisturized my skin well, while still remaining very light-textured. I'm not surprised at all, since Glycerin and Cetearyl Alcohol, both moisturizing ingredients, are the second and seventh ingredients respectively. Still, because the texture of the serum is light, if you require heavier moisture, you can layer another moisturizer over it. I tried wearing it both alone and under another moisturizer, and it seemed fine. The main source of Vitamin C is Ascorbyl Glucoside, which is a stabilized form of Vitamin C. I liked that it was the 5th ingredient in the list, and thus present in a fairly large percentage. My experiences with this product have also confirmed that the amount of vitamin C must be sufficient to have an effect - now that I'm halfway through the bottle I feel like the product does a good job at brightening my skin. The only gripe I have is that the bottle is a little small - at 15ml a bottle, just under a month's usage has taken up almost half the bottle. So would I recommend this? Yes - it's nicely formulated, it's cosmetically elegant, and it works. As I mentioned before, although I'm not a particular stickler for natural products, I feel like Apivita's products really stand up to scrutiny. If you're looking for a Vitamin C serum derived from natural ingredients and is still effective, then this will be up your alley. Apivita is available at M&S in the UK, online in the US, and at Ion Orchard in Singapore - so wherever you are, you can get your hands on the product. Although I have used a lot of products from this specific brand like face masks (the one with cucumber and another one with honey) hair products and body lotions I have never noticed that product before. Thank you for the useful review.